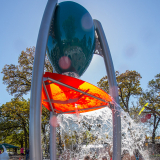 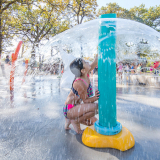 From the FlashFlood to the CanopyCluster, HydroHelix, SplashPack animals and ground sprays, this aqua playground delivers watery fun for kids of all ages and abilities. 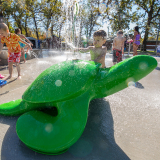 The FlashFlood delivers dynamic water play for kids looking for a rush of excitement The SplashPack Turtle and SplashPack Frog allow younger children to splash and play with gentle water sprays. 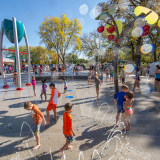 Even more, the combination of sophisticated forms and unique materials create an artful design aesthetic even when the water isn’t running.